The shadows in the premiere of Season 4 of Downton Abbey are brilliant. Figuratively speaking. As the series opens Downton Abbey is shrouded in darkness with one light on. Repeatedly, key characters are shrouded in black with just one side of the face illumined. Lady Mary. Mrs. Crawley. Mrs. Hughes. Carson. Anna. Molesley. Lady Mary is numb and unresponsive until, in a conversation with Carson, she crumbles and has a good, cathartic cry. She has been a walking sleeper and now she awakes. The next morning the sun rises and color and light explode onto the screen. Birds sing. Flowers are delivered. Mary wears a lavender dress. Mr. Molesley the Elder: In your game, if you want the best you’ve got to be the best and work at it. Mrs. Hughes: I wonder if you [Mrs. Crawley] would take this man into your home. 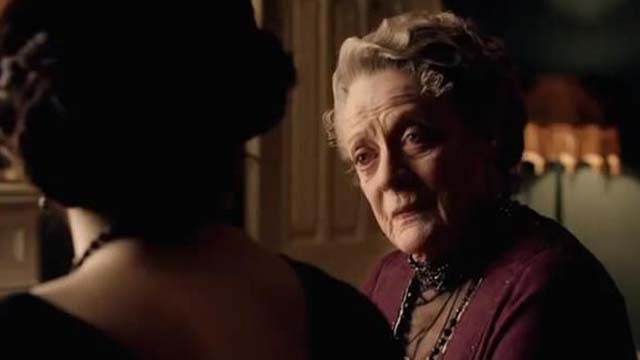 Most poignant: Lord Grantham pontificates, The price of great love is great misery when one of you dies. Softly, Branson replies: I know. Loss of nobility: Lord Grantham. Remember how decent he was in Season 1? What bugs me is how he cloaks his desire to hold power in paternal concern for Mary. What delights me is how transparent he is to Lady Grantham and the Dowager. The way they lovingly hold him accountable is his salvation. Love the mercy: Mercy flows through the storyline. Griggs receives large dollops from Mrs. Huges, Mrs. Crawley, and, finally, from Carson. Moseley can’t see the mercy of Downton keeping him on six months after Matthew’s death. He despairs, but the Dowager shows mercy to him, even Edith, dear Anna, and especially Bates. Mrs. Hughes sacrifices to help Mrs. Patmore. Mrs. Patmore’s generous gesture to Daisy. Love the justice: Nanny West gets her comeuppance. She’s such a minor character that we’ll forget her in a few weeks, but it was s-w-e-e-t to see her go. Interfering: happy outcomes from the various interferences of the Dowager, Mrs. Hughes, and Bates. Not so good from Rose or from Barrow. It’s such a great quote, but I don’t agree with Violets words: It’s the job of grandmothers to interfere. Bates and Anna: Will they replace Matthew and Mary as the happily married couple? Bates had some tender lines: You stayed young. And Why should I be social when I have you? Strength through service: Lady Mary and Mrs. Crawley were both told that they had strength in them. But they didn’t believe it until it they were of service to someone else. Grief is so inward. Necessarily so. Healing comes through kind service to others. New phrase: ‘All Sir Garnet’ means everything is as it should be, from the reputation of Sir Garnet Wolseley (1833-1913), Field Marshall in British Army, for efficiency.